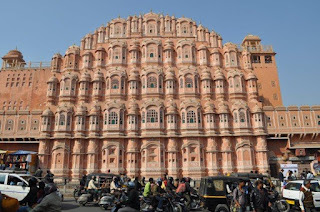 The next day we took an auto rickshaw to Hawa Mahal. Hawa Mahal used to be a palace right in the center of Jaipur. And there it is, right on a busy street in the old town. It was built for the ladies of the palace to sit and watch daily life. The entire front of the building has windows intricately carved with many small openings, allowing the ladies to view the outside world without being seen themselves. Even if the royal ladies did go out in public, which I am assuming was rare, they would cover their heads to remain unseen. 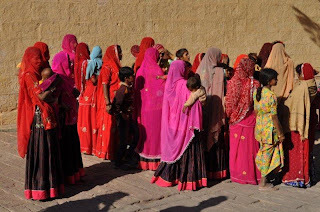 Many women in Rajasthan still follow this custom and walk outside with their sari scarves over their heads. Many cover their face as well. The kids love the audio guide so we did that again. I really enjoyed Hawa Mahal with the guide - it is mostly open courtyard upon open courtyard but again the intricately carved windows are unique.There is some beautiful stained glass work and the architecture is so interesting, as well as the history. In the afternoon we walked around the old city where there is one bazaar after another. There is organization within the chaos and each bazaar has its own theme: jewellery, leather making, kitchenware and so on. Our favorite was the sari bazaar. 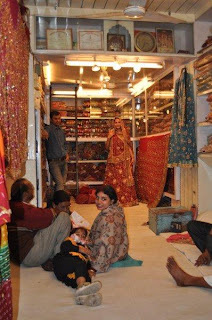 Row after row of narrow alleyways with shop after shop selling sari material. 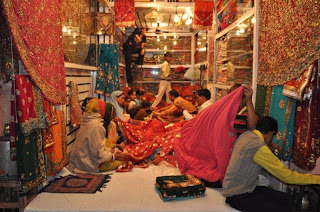 Ladies sit and drink chai while shopkeepers unravel the nine meter long material. The ladies shake their heads and fingers and prompt the shopkeeper to bring out more and more until the floor is covered with material and hopefully after much bargaining a decision is made. We came across a proud family watching their daughter try on traditional red wedding sari's. Back out to the main street, huge crowds of Muslims were gathering. The streets were closed to traffic and people were sitting on the sides of the street and crowded onto balconies and rooftops. Many people waved and smiled at us but the crowds started to remind Alanna of the Dasara crowds and she got quite agitated, wanting to go back to the hotel. It's strange how the crowds seem to change people and we all got a little jittery as people would surround us and stare and sure enough someone tried to pickpocket Michael (to no avail). We never did find out what the celebration was as we grabbed a couple bicycle rickshaws and took the kids back to the hotel. I would like to personally invite you to list your blog on our Expat Women Blog Directory (www.expatwomen.com/expatblog/) so that other women can read about and learn from your expat experiences. Many thanks in advance for your contribution and keep up your great blog!